Sheldon Theatre History runs deep here in Red Wing. 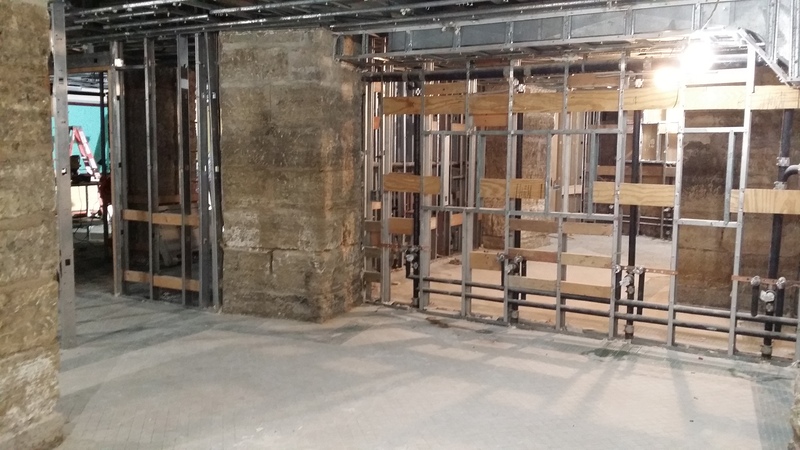 From the Jordan River, that can be seen flowing through a grate in the boiler room floor, to signatures carved in bricks high overhead near the old fly rail on stage right, to…as it turns out, inside the walls! 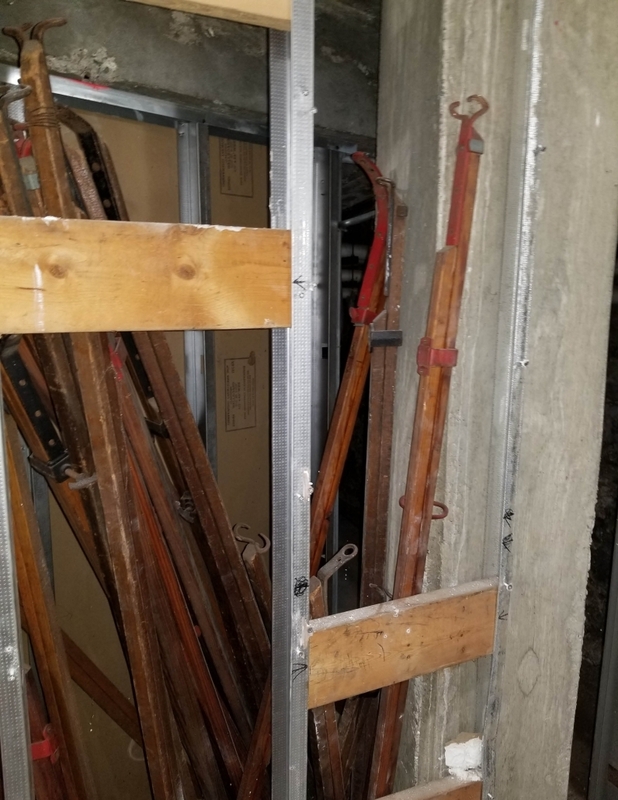 During the demolition of a wall between the dressing room area and the public restrooms on the lower level, a stash of stage braces was discovered. Was it a time capsule, sealed up for us to find 30 years later, on the occasion of this next generation renovation? Stage Scenery that requires walls and windows often utilize painted flats which are typically constructed of muslin stretched over and stapled to a lightweight pine wood frame. 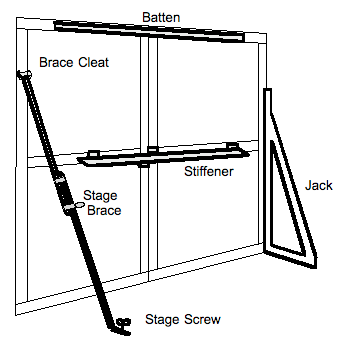 Stage braces, as seen in the definition below, are used to quickly secure scenery to the stage by hooking the brace cleat and then using a stage screw to secure it to the deck. Stage braces are adjustable to ensure the correct fit to secure different sizes of scenery. The stage braces found in the walls of the Sheldon provide a unique look back into the tools that make magic happen in theater. The stage brace continues to be a useful piece of equipment for many theaters. Some of the stage braces found inside the restroom walls still bare the original label from the manufacturer, JR Clancy, Inc. The JR Clancy company was founded in 1887 and continues on in the theatrical supply field to this day. While we don’t know the exact age of these braces, we know they’ve been in the walls for 30 years. They could date as far back as the mid-1930s in the pre-movie days of the Sheldon. The braces were, of course, removed from the wall, along with everything else in the former restrooms. The demolition work is the first step in the process of installation of all new accessible public restrooms. A stage brace, a standard piece of theatrical hardware, is two overlapping pieces of hardwood which can be adjusted in length. The top of the brace contains a “double pronged curved hook” that fits into the eye of a brace cleat. The bottom of the brace is attached to the stage floor with a stage screw. Walls Coming Down Re-imagining the Third Floor.